Release Shalidor's sanctuary from Sheogorath's lingering hold. Valaste and Shalidor have finished analysis of Sheogorath's books. Now I need to help them take possession of Eyevea, the Mages Guild Sanctuary. Talk to Valaste at the Mages Guild in Rawl'kha (Reaper's March), Evermore (Bangkorai), or Riften (The Rift). Place the books in the pillars of light. Meet Shalidor at the Guildhall. Place the crystals near the Guildhall. This quest will begin once you've reached Mages Guild Rank 5 after completing Chateau of the Ravenous Rodent. Passing any Guildhall will cause a projection of Arch-Mage Shalidor to appear before you and direct you to the guildhall in Rawl'kha (Reaper's March), Evermore (Bangkorai) or Riften (the Rift). When you arrive, speak with Valaste to learn that she has successfully translated the final tome. Help Shalidor by placing the four books at the ritual site to open a portal to Eyevea. Once you arrive, Shalidor will inform you that the island has indeed been returned to Tamriel, but Sheogorath neglected to remove its Daedric guardians. Follow Shaildor to the island's guildhall, which has been magically sealed, and speak to Sheogorath. He will reveal that the Daedra are intended as a final trial to overcome to fully release Eyevea from his influence. 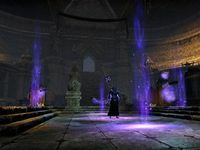 Shalidor will instruct you and Valaste to travel around the island and close portals to the Shivering Isles while he works on unsealing the guildhall. There are three portals dotted around the island, and many Daedric guardians blocking the way. Each portal has a crystal, and you need to collect the three crystals, either by fighting, or by sneaking and taking it. Valaste will occasionally make inane comments, seemingly sinking ever further into delirium, but she will continue to help you fight. Once the portals are closed, you will need to return to Shalidor and place the three crystals in three braziers outside the guildhall. Once inside, Sheogorath will confront you. As a final test, he will force you to single-handedly battle Haskill wielding the Wabbajack. Once you are victorious, the Mad God will concede defeat and relinquish his hold on Eyevea for good. At this point, however, he will draw attention to Valaste's worrying state, and propose a sinister bargain. Sheogorath will reveal that he has slowly warped Valaste's mind through the four tomes she had translated, and will demonstrate that she is now in a state of complete madness. In reference to Shalidor's original loss of Eyevea, he will offer you a deal: he will either cure Valaste of her insanity, or give you the Folium Discognitum and take her back to the Shivering Isles with him. In practical terms, the Folium gives you two otherwise unobtainable skill points. Curing her earns you her thanks, and she grants you a purple Frost Staff. After making your choice, Sheogorath will depart and Eyevea will populate with Mages Guild members. Your decision does not influence your reward from the next quest, The Arch-Mage's Boon. To other players, Valaste will appear as Guild Battlemage. Sheogorath mentions that the Folium Discognitum is worth half a dozen skyshards. I need to talk to Valaste as soon as I can. Valaste has prepared a ritual space to allow Shalidor to do his work. She's asked me to start the ritual by placing the books in the beams of light. Shalidor appeared in a nimbus of light. I should speak to him. This is it, Shalidor is set to rest Eyevea back to Tamriel. I should watch what he does. Shalidor shouted that he sensed something wrong, and dove into the portal. I should follow him. Shalidor is waiting for me to speak with him about the island. I should do so. Daedra swarm the island of Eyevea, and Shalidor is furious. He's gone ahead to the island's main Hall to look around. I'll need to fight my way through the Daedra to meet him. In his anger, Shalidor confronted Sheogorath. The Mad God easily subdued the Archmage. I should talk to Sheogorath and try to resolve the situation. Sheogorath has given this island to us, but Daedra swarm from the open portals. I should talk to Shalidor to plan our next move. Shalidor asked me to close the portals on the edges of Eyevea. That should stop the influx of Daedra. Sheogorath told me that to close the portals I'll need to pull out the nearby crystals powering them. I have the three crystals that were powering portals around Eyevea. By placing them in the sconces out front of the Guildhall I should be able to help Shalidor crack that ward. I've closed the portals and slotted the power crystals out front of the Guildhall. I should speak to Shalidor once again to see how he's doing with the ward. Shalidor removed the ward from the Guildhall doors. Time to face Sheogorath once again. Sheogorath and his assistant Haskill await me inside the Hall. I should confront him and tell him to leave. Sheogorath says he isn't the fighting type, so he's instructed Haskill to spar with me. I should do my best to defeat the Mad God's assistant. After defeating Haskill Shalidor burst his way into the Guildhall. I should watch the confrontation between the Arch-Mage and Sheogorath. Sheogorath has made me a tempting offer. He says that I can choose to have Valaste stay, or go with him. If she stays, he'll cure her insanity. If she goes. he'll give me a tome of power worth several skyshards. I should choose what to do. Optional Step: I could speak to Shalidor to get his viewpoint on my choice. Optional Step: I could speak to Valaste and see what she wants me to do. If she can understand me. Finishes quest I've chosen to allow Sheogorath to take Valaste with him to the Shivering Isles. I should speak to him again to receive my reward.